Throughout the wars in Afghanistan and Iraq, I have tried hard not to think of the wounded and dead in abstract terms. I know these wars are very personal for thousands of military families. On Friday, we learned that Sgt. 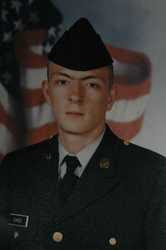 Lance O. Eakes, my second cousin, was killed in Iraq. Lance was a generation younger than me, so I did not know him well, but I still feel a great loss because of the devastating effect his death has had on other family members I care about. As you see the seemingly endless reports on the wars, please think of my family and the thousands of other families who have experienced these wars in such a personal way. The Masters golf championship begins this morning in Augusta, GA. The course is wet and will play very long, limiting the number of legitimate contenders. I do not have time for my traditional analysis and full-scale predictions, so I will provide some quick hits. Short to medium hitters will have a very tough time getting in the mix this weekend. That is unfortunate, because golfers like Luke Donald, Jim Furyk, and Tim Clark should be able to contend. Sergio Garcia: He drives the ball well and has a solid wedge game, both important parts of solving the riddle at The Masters. His putting continues to be erratic, and that keeps him from contending - out of the top 25. Jose Maria Olazabal: The two-time champion is usually a threat at The Masters because of his short game and precision irons. He has been out with health problems for a year, so you would think he would have no chance. I think he plays better than expected and sneaks into the top 40. Ernie Els: Has has contended at Augusta many times. Switched swing coaches in the last two weeks. He won a month ago, but I am not sure his head is in the game, which is a shame. He should do better, but I think he disappoints with just a top 25. Retief Goosen: Unflappable demeanor with two major titles on tough courses. He is sneaky long and a good putter on slick greens. His game has been sinking for three years, but he has been in better form lately. He also has top three finishes the last thre years. This year he gets a top 10. Adam Scott: His long game is made for Augusta with steady ball striking, but dude can't putt well enough to win The Masters. Top 25 finish. Justin Rose: Played great in all four majors last year and will again this weekend. Has a tendency to spray drives when it matters most, and that limits him to a top 15. Geoff Ogilvy: Is coming on strong and will contend for his second major. Has length, short game, and confidence. My dark horse pick to win, but I predict a top 8. Phil Mickelson: Has two green jackets and played well early in the year. He has cooled down lately, but I have a hunch he will contend for his fifth major this weekend. I expect him to be near the lead but finish with a top 5. Vijay Singh: Has a green jacket and the length to contend, plus he has been playing very well lately. If his putter is on, he can win this weekend. Top 10 finish. Tiger Woods: Four-time champ. Best pressure putter in history. Has won all but two events he has played since last summer. Has the length and aerial game for a wet Augusta. How can you pick anyone else? You can't. Tiger gets his 17th major.